Reality TV star Kim Kardashian West has shared her love for Armenian food with Vogue during her and husband Kanye West’s 73 questions interview. The host then asked in Armenian if she speaks Armenian to which Kardashian responded with the question “How are you?” in Armenian. 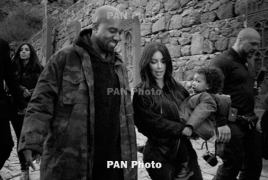 Kim, her sister Khloe, husband Kanye West and daughter North visited Armenia in April 2015 to shed more light on the country and stress the need for the recognition of the Genocide.